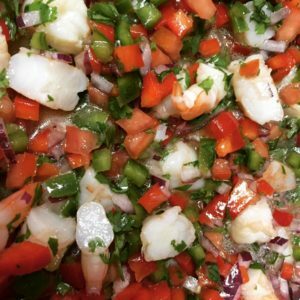 Shrimp Ceviche Recipe - Carolina Meat & Fish Co.
Any summertime party for me is not complete without a refreshing bowl of my Shrimp Ceviche Recipe…actually I could eat it all year long. Head on over to your favorite local farmers market to grab all of the fresh veggies, then grab super fresh NC peeled and deveined shrimp from The Carolina Meat & Fish Co. Do you know they can also ship to you? Check them out! As some of you may know by now, a number of my recipes have been created by taste…this is definitely one of them…grab a few extra limes and lemons…check for taste as you go along…add more as needed! Heat the seafood stock, coconut milk and a few dashes of salt in a pot to just under a boil. Add shrimp and cook for 3 to 4 minutes until shrimp are no longer translucent and turn pink. Drain shrimp in a colander…do not rinse. Cool then cut each shrimp into bite size pieces (about 3 pieces per shrimp). In a large bowl, squeeze the juice of the limes, lemons and orange. Add the diced vegetables, cilantro and olive oil. Season with salt and pepper. Add cooled shrimp and toss to coat. Taste to see if you need additional lime juice or salt.